Lido Marini is situated on the South West coast of Italy, between Gallipoli, Santa Maria De Leuca and Presiece, all three towns are open all year with shops bars and restaurants and about a 15 minute drive by car. 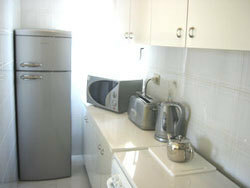 Our apartment is just a 2-minute walk to the beach and the local bars shops and restaurants. Lido Marini is a holiday resort very busy during the months of June to Mid September and very quiet the rest of the year. The resort enjoys a wonderful golden sand beach with very swallow clear blue waters. Out of season we would recommend you hire a car. 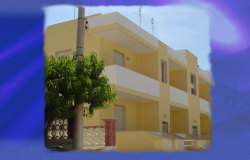 The apartment is very comfortably furnished and equipped, with a balcony to front and rear and a roof terrace with sea views. The apartments sleep 5 with one double and one single bed in the master bedroom, and two single beds in the second bedroom. 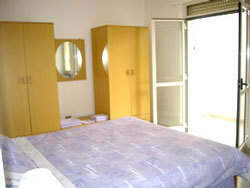 The apartments are on the first floor accessed by 2 flights of stairs. Parking space is normally available in front of the apartments.